Att fira jultid med glögg! / Celebrating Christmas with glögg! Ahhhhh… the Christmas season. There is fresh snow on the ground, the air is fresh and crisp, and the wonderful smell of firewood burning in the fireplace lingers outside. (By the way, that’s one of my favorite “smells” of this season!) How best to celebrate this cozy season than with glögg, the Swedish version of mulled wine? I was introduced to glögg my first year in Stockholm and have since thrown a glögg party every year, just like any truly Swedish person would do. It is actually a lot of fun trying the different glögg flavors that are available today. Yesterday, I hosted a glögg party at my apartment for some close friends. I decided that I didn’t want to throw a glögg party this year since I already hosted the Halloween party already, but since Josh’s birthday was this weekend (Happy 30th, old man!) I went with it. It was good fun! This is another #TrulySwedish tradition that everyone likes to go to. Whereas back in the US you’d get invited to a Christmas party (maybe with a funny theme, like an ugly Christmas sweater theme or a white elephant gift exchange theme), the party doesn’t really have much of a focus (other than Christmas, of course). But in Sweden, the parties are specifically focused on the glögg. Hence the name, glöggfest (glögg party). It makes perfect sense – it is so cold outside that the only thing you want to do is to stay inside, light up some candles, and relax with some good friends. Glögg is a good way to do that. 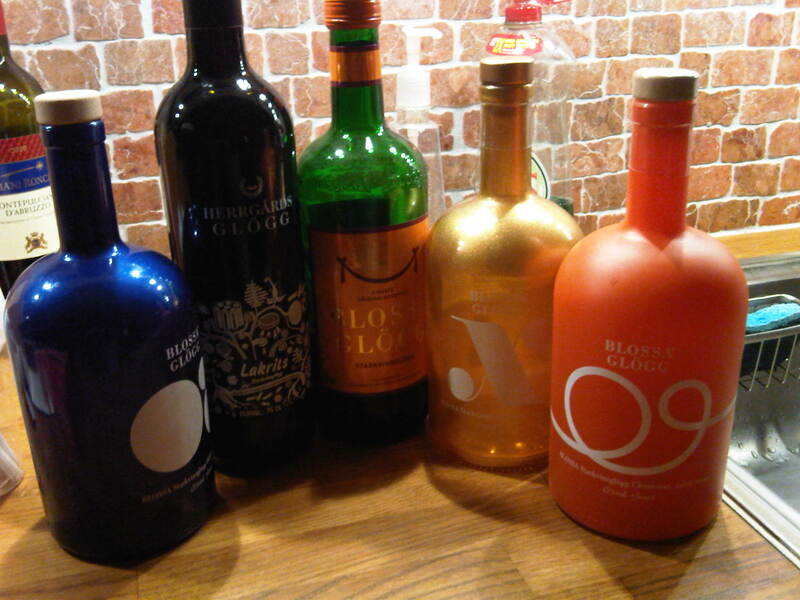 Between my friends and me, we tried the year’s Blossa flavor (saffron), and a few flavors from prior years. We also tried glögg with cognac, a chocolate glögg, a variety of other Swedish glöggs, and a non-alcoholic version for the expectant. 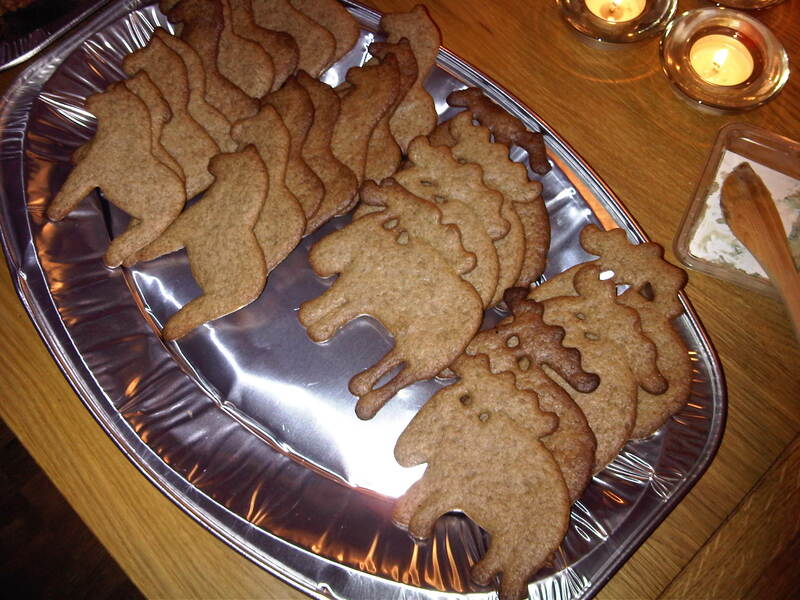 her own pepparkakor (ginger snaps) for the party in the shape of Dala horses and moose. And of course, for those truly Swedish that want a little savoriness with their sweets, we had some bleu cheese on hand to spread on the gingersnaps. Glögg can often be too sweet if it’s all you’re drinking all night. But when you do it just right, it is surprisingly good. My half-Swiss half-Swedish friend Alex brewed his own glögg during the week and brought over a whole liter of it. It was the best glögg that we tasted during the night. Everyone went back for 2nds and 3rds, and soon the whole liter was gone. Glögg – a great reason to bring your friends together for a cozy evening. How many glögg parties did you go to this year? This entry was posted in Culture, Drinks, glögg, Parties, Social, TrulySwedish on December 12, 2010 by Kenneth Chen.